View on Blackheath, then in Kent, near the Hare and Billet Inn. This was a lone coaching inn on the road through the heath. A sign outside the inn says 'Fine Ale and Cyder'. There is still a Hare and Billet pub on Hare & Billet Road in Blackheath today. 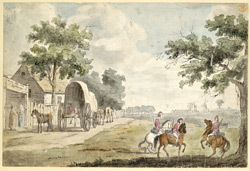 In the picture there are soldiers on horseback and riding in the back of a wagon. The Roman road between London and Canterbury/Dover crossed the heath, so many travellers passed this way. However the Heath was not considered very safe in the 18th century, because Shooter's Hill was notorious for highwaymen. The artist Thomas Luny (1759-1837) had served in the navy and specialised in marine views. He exhibited at the Royal Academy from 1780.